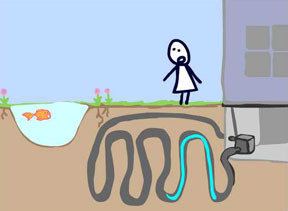 Click on the image to view a short animation about how geothermal heat pumps work. Pipes are buried in trenches at least four feet deep, and a fluid (either water or an antifreeze mix) is circulated through the pipes and back to the heat pump inside the building. The pipes can either be horizontal or vertical. Horizontal closed loop systems are the most common system for new residences, especially where sufficient land is available. Vertical loop systems are more common for school and commercial buildings where the large amount of space necessary for horizontal systems is not available. Uses ground or well water directly as the fluid that circulates through the heat pump inside the building. One the water has circulated through the pump, it is returned to the ground through the well, a discharge well, or the surface. This type of system is only practical where there is an abundant source of water, and all local regulations and codes relating to groundwater discharge allow such a system.